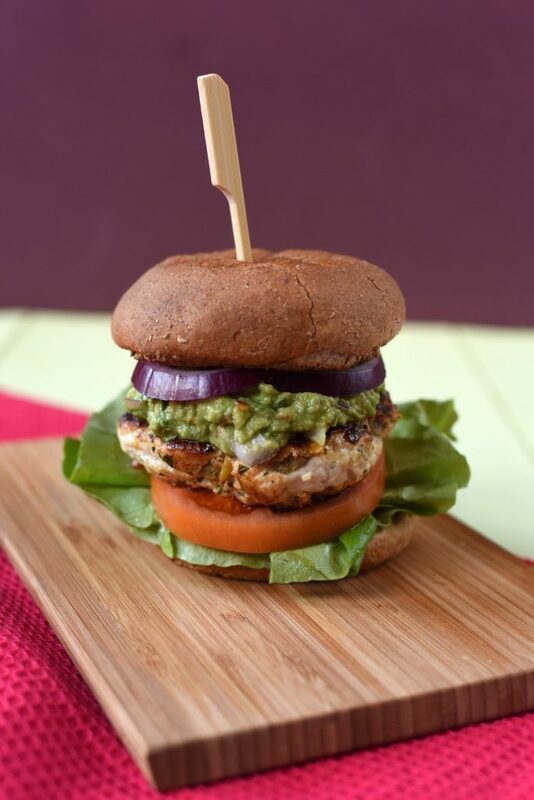 These Chicken and Cheddar Guacamole burgers are a much leaner option than most burgers and they are packed full of healthy fats too. Ditch the drive-thru and try making these instead. We are all about helping you to reach your goals this year. 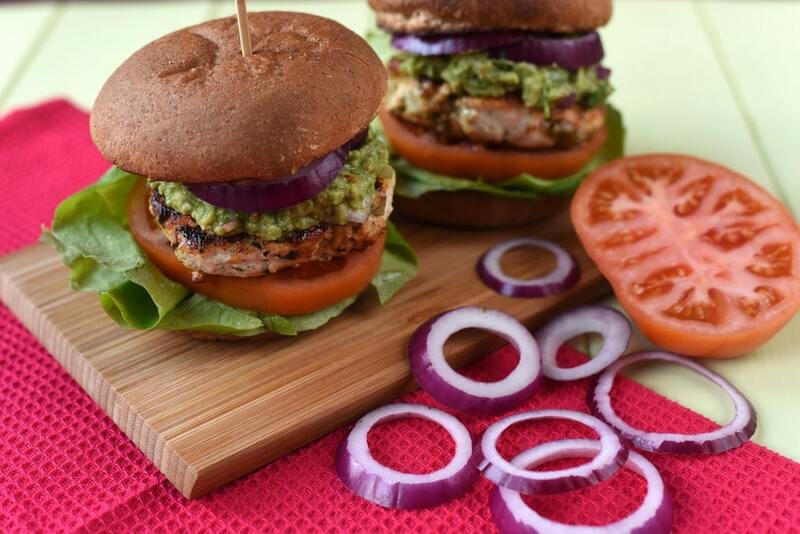 Yesterday we gave you a soup that would help to increase your vegetable intake and today we are helping you to ditch the takeaways and save yourself some money by making burgers at home. We must admit, we got in to a bit of an unhealthy habit with ordering food last year. What with Dannii’s pregnancy cravings, her food aversions, us both being tired from the new work change and then baby coming along and us really not knowing what day it was for the first 4 weeks, let alone what we were going to have for dinner, we turned to convenience food. But, it never tastes as good as it does when you make it yourself, so we were always disappointed, and we ended up spending a fortune. Money wasted on food that doesn’t really taste that good. Sound familiar? 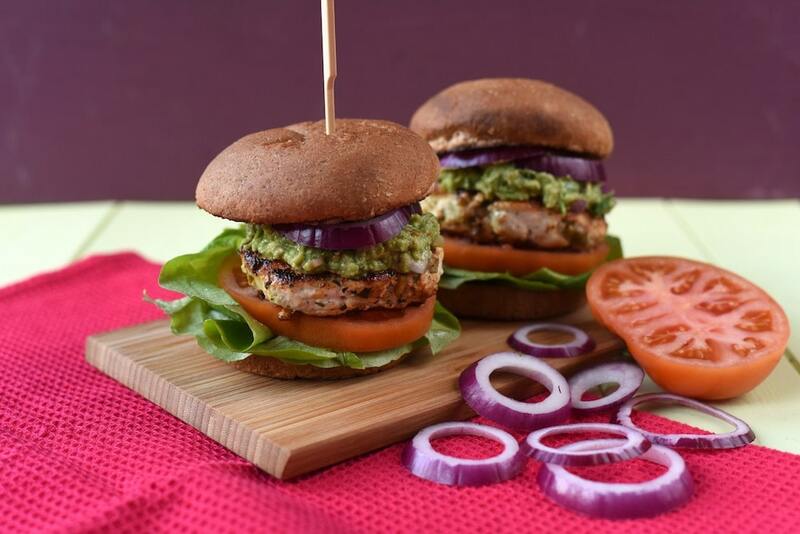 If you find yourself in that situation and you want to change it, then you have come to the right place, as we are all about proving healthier alternatives to your favourite food and one of our favourite foods is burgers! Dannii discovered this burger combination in a restaurant in Nashville and she has been meaning to try them at home ever since. We have been missing out! I know you might associate burgers with summer and putting them on the barbecue, but we eat burgers all year round and Saturday night is usually burger night in our house. 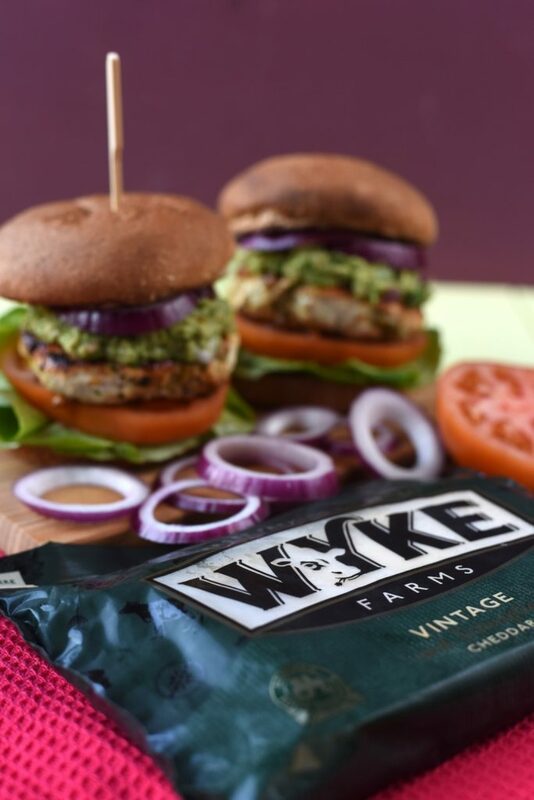 We try to always keep them lean, so we use chicken or turkey when having a meat burger, but they will always have a really good cheese with them and the Wyke Vintage Cheddar we have used in these burgers gives them a creamy burst of flavour. 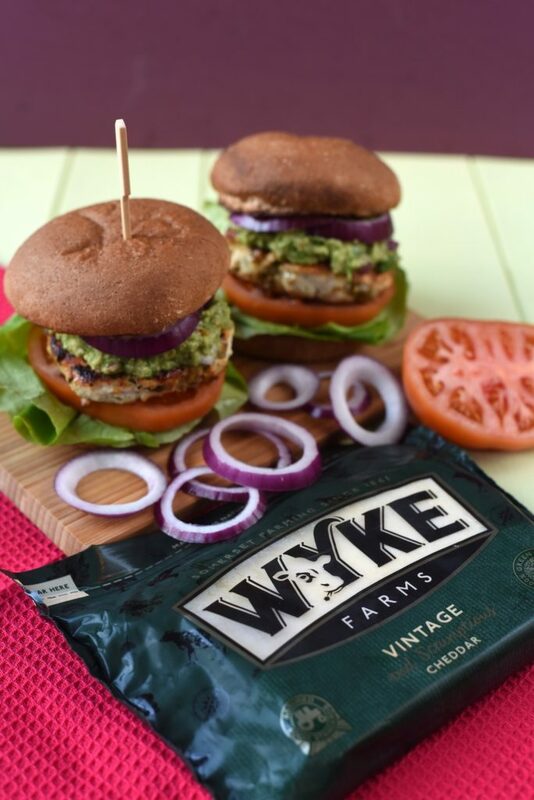 We have teamed up with Wyke Cheddar this year to show you that cheese doesn’t have to be ditched if you are trying to improve your diet and it can definitely be part of a healthy lifestyle. When it comes to cheese, it really is about quality over quantity and Wyke has got you covered when it comes to quality. And quantity if you look at the size of this block of cheese they sent us for Christmas. We were in cheese heaven! We always go for a mature cheddar when we use it in our meals, because it has such a strong flavour that you can use less of it, which means less calories. It’s kind of the same way we feel about dark chocolate. Wyke has a fantastic range of mature cheddars and if you really love an aged cheddar, then their Vintage Cheddar is one to try. We had it on our cheese board this christmas and it was the first one to be finished, and cheddar is usually the last one left – so that really is saying something. Mature cheddar is a great way to add some extra flavour to your meals and it’s a good source of vegetarian protein as well. Cheese isn’t unhealthy, a single food isn’t unhealthy, it is just the habits you form and in a healthy serving size cheese should definitely be part of your diet. Why not have #CheeseForTea this week and give these burgers a try. 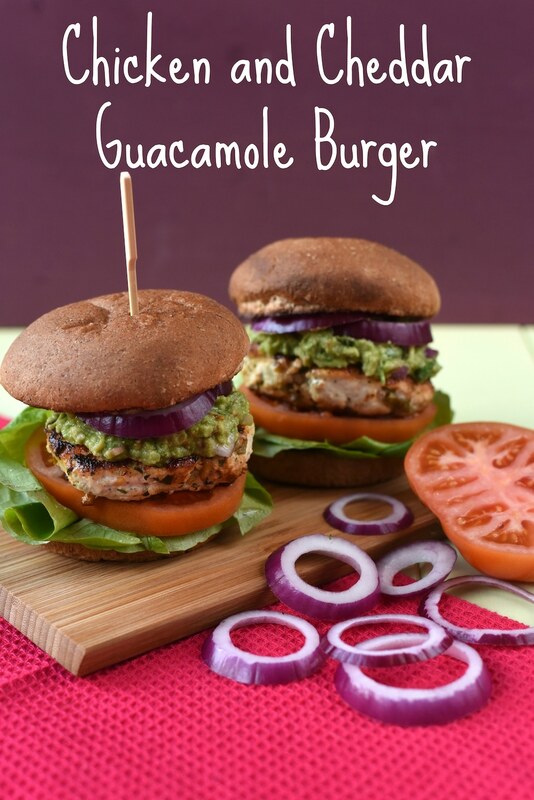 These Chicken Guacamole burgers are a much leaner option than most burgers and they are packed full of healthy fats too. Ditch the drive-thru and try making these instead. Put all of the burger ingredients in a bowl and mix well and form in to 4 burgers. Put in the fridge for 30 minutes before cooking. Heat some oil in a pan and then add the burgers. Cook for around 5 minutes each side, until cooked through. Make the Guacamole my mashing up the avocado and mixing through the rest of the ingredients. Toast the burger buns and add the burgers, onion, lettuce and Guacamole and serve. this is the real deal..guacamole with cheese..my best burger. Oh my! I love idea of vintage cheddar on the chicken burger. Looks delicious! A really tasty looking dish; I imagine all those flavours go really well together. Chicken and gucamole is such a nice combination. It is definitely easy to start a bad habit of ordering takeaways often. 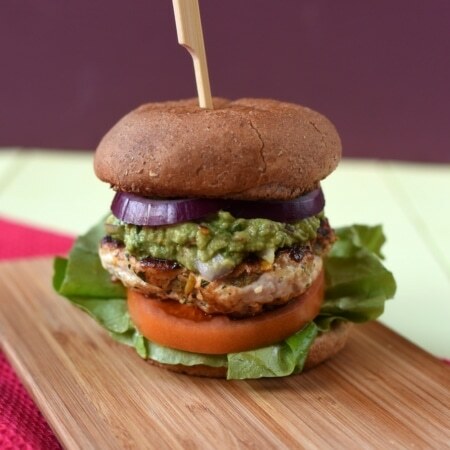 This recipe looks so delicious and much better than a takeaway burger. Also, you can’t go wrong with some mature cheddar! This looks so good, I love chicken and cheese so this is pretty much a ‘ticks all the boxes’ meal for me. I have become quite bad for ordering more takeaways than I would like. I have started filling the freezer with bulk meals though, so hopefully that will help. I’m definitely making these tomorrow. i have all of the ingredients and adding guacamole to a burger never crossed my mind. love it!